An approaching cold front will slowly make its way through Louisiana Tuesday into Wednesday. Morning observations show northwesterly winds and slightly lower dew points are beginning to dry out north Louisiana. Until that front arrives locally, scattered showers and storms remain in the forecast. Today and Tonight: Morning showers will increase in coverage across the area through the day. Moisture and instability will interact with the lift of an approaching cold front to trigger scattered showers and thunderstorms. Simulated radar indicates that most of the action will be in the southern half of the 13 Parish, 3 County forecast area. Since dry air is racing ahead of the front, this makes sense. The drier air aloft may also open the door for some storms to produce gusty wind. Highs will make it into the low 90s before any downpours knock temperatures down. Overnight, clearing is expected with light northwesterly winds and lows in the low 70s. 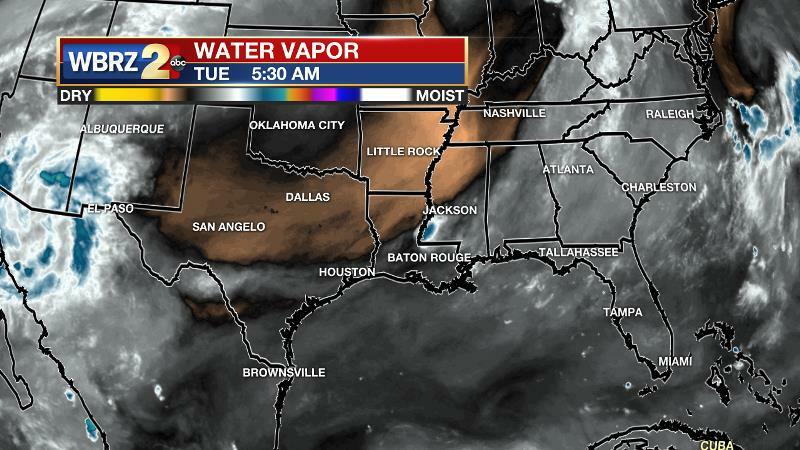 Up Next: A cold front will actually push into the Gulf of Mexico on Wednesday, swiping away a good deal of moisture. This will lead to much lower rain chances and a noticeable drop in humidity. It is still summer, and dry air actually warms more efficiently than humid air, so afternoons will be just as sweltering but mornings will be a bit more comfortable. Thursday is likely to be the time in which these changes are most evident. Humidity and rain chances will begin to increase Friday. The Tropics: As we near the heart of hurricane season, the Gulf of Mexico, Caribbean Sea and Atlantic Ocean are all quiet. 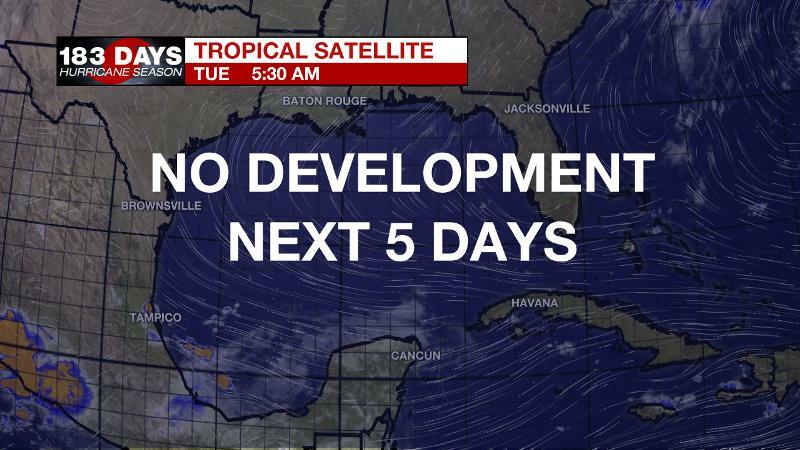 No development is expected over the next 5 days. A low and mid-level trough will dig into the Southeast, all the way to the Gulf Coast through Wednesday. This upper level feature will guide a surface cold front trough Louisiana and Mississippi. Water vapor imagery shows a large area of dry air pushing southeast across the Lower Midwest into the Mid-Mississippi River Valley. The cold front extends from Illinois to central Texas. Dry air is beginning to outrun the front so while enough instability and lift will be present, moisture may become an issue for robust development. Still, rain coverage of 40-60 percent is expected and storms could produce downpours, frequent lightning and possibly gusty wind. Rain chances will diminish on Wednesday as the trough shifts east and the cold front settles into the northern Gulf. The front will bring drier air; dew points and even morning lows could be dropping into the upper 60s for some locations (mainly I-12 and northward). The drier air warms more readily than our typical humid air though, so afternoon highs are likely to be just as warm. Mornings will be a bit more pleasant. This little break will be short-lived with moisture and rain chances returning Friday.